How to Donate | Keep Indianapolis Beautiful, Inc.
At Keep Indianapolis Beautiful, giving comes in a lot of different forms. No matter how you’re able to give, your donation will make a meaningful impact on the people, plants, and health of our city. Pick the one that suits you best! 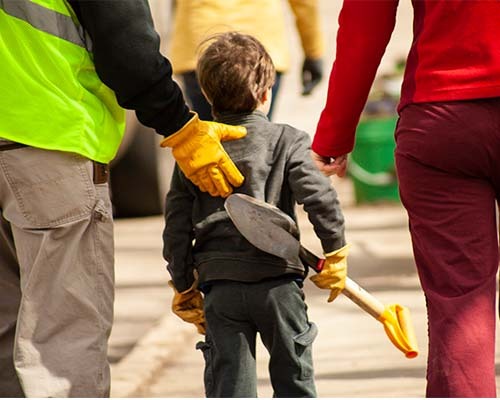 Your gift plants trees and native habitats, makes cleanups possible, creates nature spaces for elementary schools, and connects thousands of residents and volunteers to our amazing city. Even better? When you become a monthly donor, you’re an ongoing part of creating sustainable, beautiful environments for people and nature in Indianapolis. The KIB GUILD is a community of monthly givers whose support allows us to plan better and allocate resources in advance. The KIB GUILD consists of donors, big and small, all making a difference. Whether you choose to give $5 a month or $5,000 a month, we want you in our guild. To learn more about monthly giving, click here or contact Tara Cobb at tcobb@kibi.org or 317-264-7555 x107. Give the gift of a tree planted in Indianapolis! We’ll mail a card to your recipients to let them know that you’ve supported the planting of a tree in their honor or in memory of a loved one. When you make a contribution of $100 or more to KIB, we will plant a tree and send a beautiful card to your recipient, to let them know that you’ve supported the planting of a tree in their honor, in celebration, or in memory of a loved one. Just fill out the form, and then go to Donate Now to process your gift! You will receive a personalized card to present to your gift recipient. How much does each tree cost KIB? Each large, native Indiana tree costs $100 on average. Each tree will be planted on Indianapolis public land (in a neighborhood, or park, or right-of-way), to grow and benefit us all. Trees will be planted in the spring and fall (during KIB’s planting seasons), at regularly scheduled KIB tree planting projects. You are welcome to attend one of our plantings to help plant “your” tree,” and then you can come back to watch it thrive! Go here to view upcoming KIB tree planting projects. KIB volunteers will plant the trees. Note: KIB’s Legacy Tree program does not provide plaques or other memorial items — rather, proceeds of your gift go directly to supporting a beautiful, large, Indiana native tree. KIB cares for trees until they are established, for a 2-3 year period after planting; tree care either occurs through an agreement with our planting project partner, or directly through KIB’s Youth Tree Team, if the tree is in a public place. Be on the lookout for in-kind donation ideas, such as mulch, plant material, tools, or even advertising! In-kind donations are resources that help KIB achieve its mission. To discuss your possible in-kind donation, please contact Kristina Uland at kuland@kibi.org or 317-264-7555 x112. To learn more about donating stock (and how to take advantage of significant tax benefits), please contact Shannon Priddy at spriddy@kibi.org or 317-264-7555 x119. Planned giving provides substantial tax advantages to donors and leaves a lasting legacy in the community. Our Development Team can work with you and your financial advisor to create a planned gift that best fits you. To learn more about planned giving options, please contact Shannon Priddy at spriddy@kibi.org or 317-264-7555 x119. Consider making a gift to the Keep Indianapolis Beautiful Maintenance Fund to help KIB support lasting, beautiful places that impact neighborhoods throughout the city. For more information, please contact Shannon Priddy at spriddy@kibi.org or 317-264-7555 x112. Have you seen fundraisers on Facebook? Start one of your own to support KIB. It’s simple, and you can invite your friends to join! Select Keep Indianapolis Beautiful, choose a cover photo, and fill in the fundraiser details. If you have a knack for event planning, consider hosting a KIB fundraising event at your home, work, school, or neighborhood park! The sky’s the limit for fundraising ideas, so let your creativity run wild. Our donors have hosted pollinator counts, cocktail parties, picnics, kickball tournaments, bike-to-work days, giveaways, game nights, and more. To begin planning your event and sign up to receive your KIB fundraising kit, contact Shannon Priddy at spriddy@kibi.org or 317-264-7555 x119. Are you interested in providing an opportunity for your employees to support KIB’s work through monthly or quarterly payroll deductions? Contact Kristina Uland at kuland@kibi.org or 317-264-7555 x112. for more information. SUPPORT KIB while you shop! You can donate to KIB—at no cost to you—by shopping online at AmazonSmile. Choose Keep Indianapolis Beautiful to give a percentage of your order to KIB. Sign up and get shopping! Purchase a Giving Bag at Fresh Thyme Market and request that $1 get donated to KIB. Did you know that many companies like Roche, Eli Lilly & Company, and Starbucks will match the donations that their employees make to nonprofits? Some also match their employees’ volunteer hours! Check with your company’s human resources department to find out about its matching-gift policy. Don’t see a giving option that works for you? We can work with you!